Fifteen walkers enjoyed an excellent walk in the Peak District today expertly led by Alan Beale. It was a quiet sort of day weather-wise – still and overcast with cloud cover quite high, so we were fortunate enough to have no rain. Alan had planned to take us up hill (at the end of the walk) and down dale – well, there were two of them ….Biggin Dale and Wolfscote Dale, taking in a stretch of the River Dove in the process. We started off beside the Tissington Trail, reluctantly resisting the appetising smells of bacon butties emanating from the mobile transport caff in the large layby at Alsop Moor Cottages where we left our cars. We set a cracking pace north along the Tissington Trail for well over a mile or so, enjoying the wide open views, then turned off the Trail, following footpath signs for Biggin village. This took us across grassy fields with sheep and gambolling lambs, towards the edge of the village, where we took our coffee stop surrounded by convenient dry-stone walls and watched by some suspicious sheep. Apparently, Biggin was once particularly noted for its sheep and cattle markets, of which there were several throughout the year. There used to be as many as 14,000 sheep sold there a day. Now they’re sold at Bakewell in the new market. Duly refreshed, we continued through the village past some rather bleak council houses which we were reliably informed were prefabs (but with lovely views to compensate), a very nice village hall, the village pub with small caravan site attached, and the 17th century Biggin Hall County House Hotel. Alan had downloaded the lunch menu (£12 for 2 courses and £15 for 3 courses) and the menu sounded pretty good. Some of us wandered up the drive to investigate the buildings which looked attractive. We decided this venue was very worthy of further investigation for the Joint Walkers Christmas meal!! 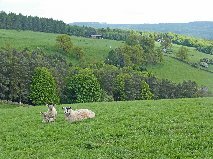 We continued along the road towards Hartington and Heathcote, then peeled off left on a track which took us down into the grassy upper slopes of Biggin Dale, where we could hear the skylarks singing above us – lovely!. We continued downwards, following a rocky path beside a sheltered stream which flowed through lichen-covered and rather mysterious silent woodland. The dale then opened out, where we came across some very long horned cattle grazing in the grassland beside the path – luckily on the other side of the drystone wall – and the steep sides of the valley were covered with scree and golden gorse in full flower. We carried on down this path until we reached Wolfscote Dale on the beautiful River Dove, where Alan had chosen a delightful lunch stop on the river bank. There was one other occupant when we arrived, sitting in prime position with his watercolours, peacefully painting….much to our surprise, he moved off pretty soon. After a welcome refuelling lunch break, we carried on walking along the banks of the River Dove past Gypsy Bank Bridge, a cave, the Iron Tores water pump and swathes of daffodils in full flower. Photographer Dave was inspired to take a group shot of us all posed on Coldeaton Bridge, which was the furthest point that we ventured down the Dove valley on this walk. Alan had warned us about the steep climb from the valley floor back up to the Tissington Trail for the final mile of the walk, so we gathered ourselves for the final assault, but in the event, it wasn’t too bad. We turned up a steep rocky path away from the River Dove and were soon feeling rather warm. We stopped for a well-earned breather as we emerged from the wooded valley and took in the splendid view looking back down the dale that we were leaving behind. We still had some more climbing to do up the grassy paths, but this felt much easier now that we were in open terrain once more. We rejoined the Tissington Trail for a few hundred yards and then crossed the main road back to reach our cars, after a thoroughly enjoyable 6.5 mile walk. Last Thursdays walk was a great success with superb weather and new countryside in the National Forest. There were 10 walkers and Milo. The walk started in the Sence Valley Park which is located between the Snibstone Discovery Museum and Ibstock. The walk covered ground that was once a large opencast coal mine. It was almost impossible to see that such a dirty industry was in the area. The reclamation works have delivered an impressive country park which is now well wooded, contains a few lakes which attract wildlife. We finished the walk at Cattow’s Farm and Tea Shop. Our thanks to Bill who took us to a new area. If you want to explore the National Forest, there is a good guide at http://www.nationalforest.org/. Our next walk is on 20th May. It is being led by Judith Couch and will be in the Eastwood area. I have now closed the membership of our group as we have reached 40 members and groups of almost 20 have come on walks. The consensus of the group suggests that about 15 walkers is optimum. As there is a short waiting list already, I will be asking current members if they want to continue as members. There is a U3A rule that states if you have not attended 4 consecutive group meetings (walks), then your membership should be offered to someone on the waiting list. Please give it some thought. I will be leading the June walk but it is now time to find ‘leaders’ for July, August and September. Any volunteers? Sence Valley Forest Park is a 60 ha country park created by Leicestershire County Council on a former opencast colliery site near Heather. The site was named in the summer of 1998 following a competition among local schoolchildren. It includes the River Sence and three major lakes, which attract a wide variety of wildfowl. Large areas of the site are planted with Corsican pine, larch and poplars, which will provide an income when they are thinned in about 20 years. In addition, a range of native broadleaf trees have been planted to give variety and provide a habitat for wildlife. Meadows and open glades in the woodland also provide habitats for a variety of wildlife, including birds, insects and butterflies. It’s a Tough Life in Retirement. 14 of us completed the first medium walk of 2015 on Tuesday. We left the car park promptly, driving into a heavy downpour which made us think that, together with the weather forecast, we had been wrong to start. We weren’t. We enjoyed a great walk, which many thought should be repeated in the summer. Thanks to Paddy for finding and leading the walk. We had some high winds, blue sky and sunshine and winter storms which drove stinging snow into our faces. We delayed our coffee stop until we could shelter in the lee of the Bear Inn. We were able to sit down and have a quiet stop. Once we left it became hard to find a sheltered lunch spot until Ann found a clearing in a pine forest, which turned out to be perfect. You can see both of these in the attached photographs take by Anne Hart. There was some mud but so much that it was unpleasant. I think the varied conditions actually added something to the walk. The walk was 6.4 miles. We returned to the start at 2 ish (I think, but I’m not really sure) and after removing over-trousers, boots and fleeces we retired to a new cafe (the old Derwent Arms) just 50 yards away fro our cars and just before the bridge over the River Derwent. Scones, Carrot Cake, Cappuccinos, lemon tea,Americanos and lattes were enjoyed in comfortable arm chairs and settees. The cafe is highly recommended. During the day I discussed our start time with several people and, having had one group member back out because they could not get through the traffic to meet at 9-00, the next start time will be moved to 9-30. If this works well, we will stick to this time. Any views? I am looking into the practicality of a ‘sunrise walk’ to the top of Mam Tor. A quick look at sunrise tables suggest the end of March would be best. Even at this time it would mean a very early start about just after 5 am. This would be an extra walk if there is enough interest. Any comments? I hope everyone enjoyed themselves. Details of the next week will follow in about a week. The combined long and medium walkers walk last August went ahead on a splendid day for walking. After the predicted very steep ascent at the start we had a fairly easy tramp along Derwent Edge made even more pleasant by the National Trust’s laying of huge paving slabs across the boggy areas. Also, as we had good visibility, we could enjoy the views. I think we were all quite tired after the 8 miles of walking and the “tea and cakes” gang retired to the tea rooms of the herb nursery in the Hope Valley. September’s walk was easier walking from Ilam Hall via Thorpe to Dovedale and back. Dovedale was much enjoyed by Milo, our dog whilst we had lunch near the stepping stones. As I write it is a beautiful clear morning like it was on Wednesday when 9 of us and Milo enjoyed a walk from Ilam Park to Dovedale via the village of Thorpe. The air was very clear and the sunshine and shadows made Dovedale spectacular. The tea and cake at the end was also enjoyable. 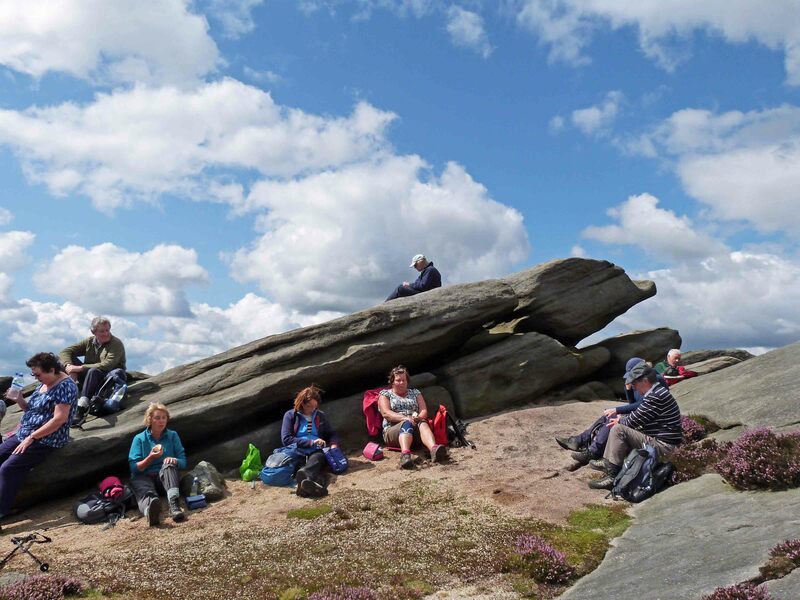 Oct 15 Long walk with Alan Beale going to Froggatt and the Edges. It is a really good walk. Tuesday October 28th. Medium walk. I will let you know the location later. December: joint Christmas walk with the Long Walkers on either Tuesday 9 or Thursday 11 December. Judy asks if you have a preference. Reply to judylloyd@talktalk.net. Finally Alan Bailey will take over the leadership of this group after the November walk. I am sure you will give him your support especially in volunteering to lead walks. You have not seen the last of me as I will be volunteering to lead a walk or two and of course coming on the others. The next walk will be on Wednesday 24 September starting at Ilam Park and will be a 5 mile walk. We begin by walking along the Manifold, up to Thorpe, down Lindale to Dovedale and back to Ilam. If there are any “tigers” in the group you can climb Thorpe Cloud on the way and we will wait beside the Dove while watching Milo splashing around in the river. We meet at Bramcote Hills car park to leave at 9.30 and drive to the National Trust car park at Ilam House. (NT members have free parking otherwise £4). Post code is DE6 2AZ. There are toilets at Ilam Park and at Thorpe on the way round. I am sorry I cannot emulate the Long Walkers in having a pub lunch but the tea room at Ilam is excellent. The group has had two interesting and beautiful walks in the Peak District and by the time you read this I hope we will have had a challenging and stimulating walk along the Derwent Edge above Ladybower in a joint walk with the Long Walks group. We were one walk short this time due to a brief and annoying virus which hit me. However, we had a walk from Bakewell up to Great Longstone in July which was a haven of peace with plenty of butterflies. There was a chance to admire the houses in Great Longstone and there were some stocks if we misbehaved! A stroll back on the Monsal Trail stopping off at the Hassop tearooms made for a complete day. In June we walked from Chatsworth garden centre through the woods down to Rowsley and back along the Derwent. Tea afterwards was split between the Garden Centre and Caldwell’s mill since the latter accommodates dogs! I have now led the group for three years and have had many good times with a friendly and cheerful group of people and I am looking forward to the walk in August as a perfect way to celebrate my 75th birthday a few days later. I am looking forward to leading the group for a while and hoping that in time someone will take over. To help this transition and to allow the group to continue I want some members to volunteer to lead walks in addition to me. I feel that it not fair on the membership if it is dependent too much on one person. This way it (and perhaps yours truly) can continue a long time. You can contact me on 0115 917 5609 or at william.taylor64@gmail.com I put the details of each walk on our website as well as emailing members. We had a splendid combined walk with the Long Walk group on Tuesday. There were 13 walkers and 1 high speed dog especially when a hare poked its head up. We were also lucky with the weather. The sun gave us a lift and also made the colours of the heather more vivid. My car load enjoyed tea and pistachio coffee cake at the Riverside Herbs centre near Hathersage. I ask for volunteers to lead walks in the same way that Judy does for the Long Walks. This group walks in the last full week of each month (except December). The leader would choose the time and place of the walk. One or two members consider becoming leader in the future perhaps being deputy leader for a while. There is not any onerous admin – just planning a programme of walks, a bit of communication, and thinking ahead. Finally I am waiting to see which makes me more tired. Was it the recent walk or will it be celebrating my grandson’s second birthday at the weekend. Firstly a reminder of the 6.2 mile easy walk starting at Bakewell on 24 July. We meet up to share cars at Bramcote Hills Park at 9.30.For parking in Bakewell it is just as easy to use the main Park & Ride car park on the A6 as you get near the town centre. It is only about 400 yards walk to the River Wye bridge and the walk ends at this car park. The walk is an 8 mile moderate walk taking about 5 hours and starting at Ashopton which is at the eastern end of the Ashopton viaduct at the Ladybower reservoir climbing up to and along Derwent Edge and making our way back to the reservoir at Wellhead. Once you have conquered the first 25 minutes which is a steep climb up to Derwent Edge the rest of the walk is fairly easy walking although there are 2 steep but not awkward downhills later on. On the whole it was fairly dry when I walked it in mid June. If the weather is good, the views are stupendous and the rock formations amazing. If anyone wants to bring a dog please be aware that we cross restricted open access moorland. 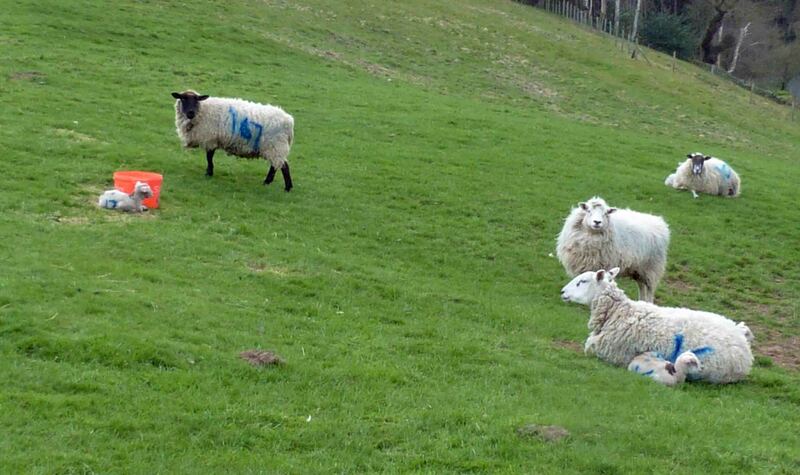 Dogs must stay on the paths due to lambs and ground nesting birds. I saw a fair number of curlew and their fledglings as well as hearing skylarks. The suggested parking is the lay by at the eastern end of the viaduct but being school holidays there might not be enough room so I suggest we park in the Severn Trent Heatherdene facility on the A6013 just before the T junction with the A57. (It adds 1km each way to the walk). There are toilets in Bampton just before on the A6013 on the left hand side, or if you come through Baslow there are toilets set back behind the green before you reach the Devonshire Arms. 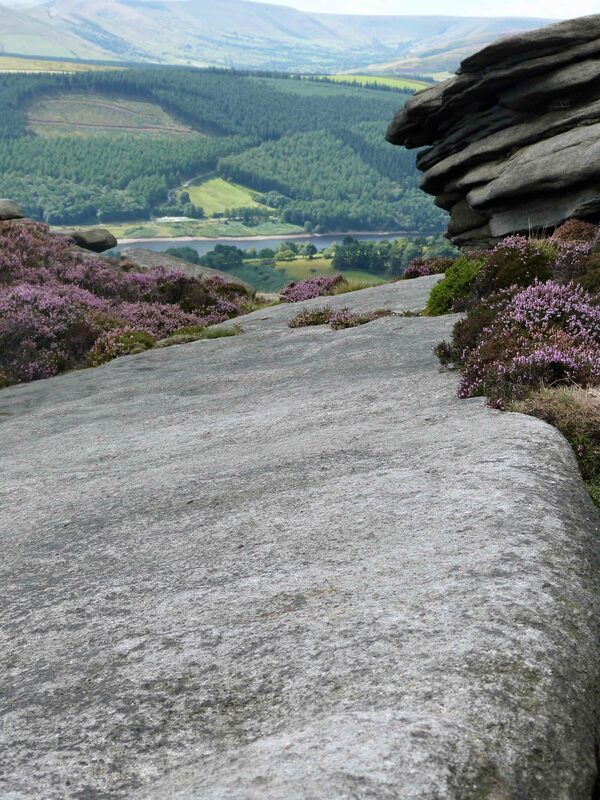 After a winding, steep climb up on to Derwent Edge you will be amply rewarded by the never-ending, breathtaking views over the Derwent Reservoir. Lift your eyes and you are looking over at Win and Lose Hill and the ridge over to Mam Tor. In the far distance stretches the Kinder plateau. 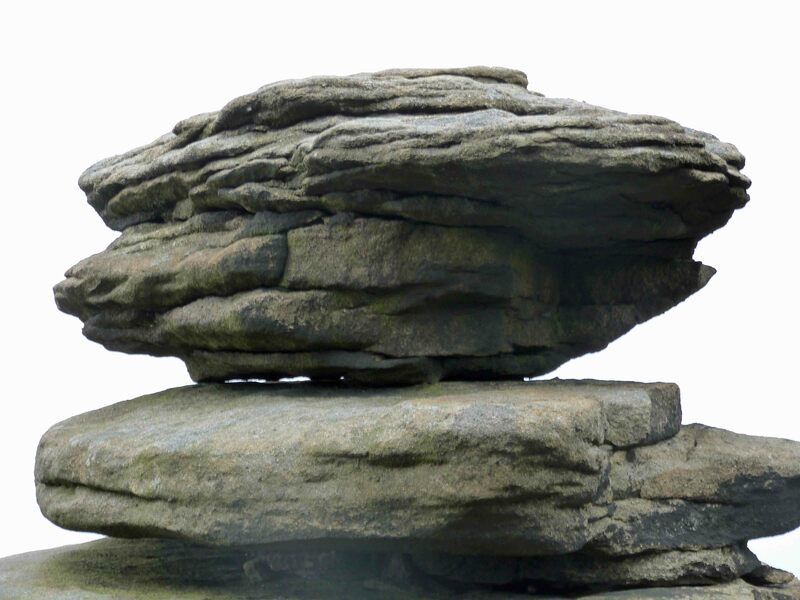 You are now in the upper valley of the River Derwent and walking along this beautiful gritstone edge with its amazing rock formations, given such fanciful names as Coach and Horses, Hurkling Stones, Salt Cellar and Cakes of Bread. 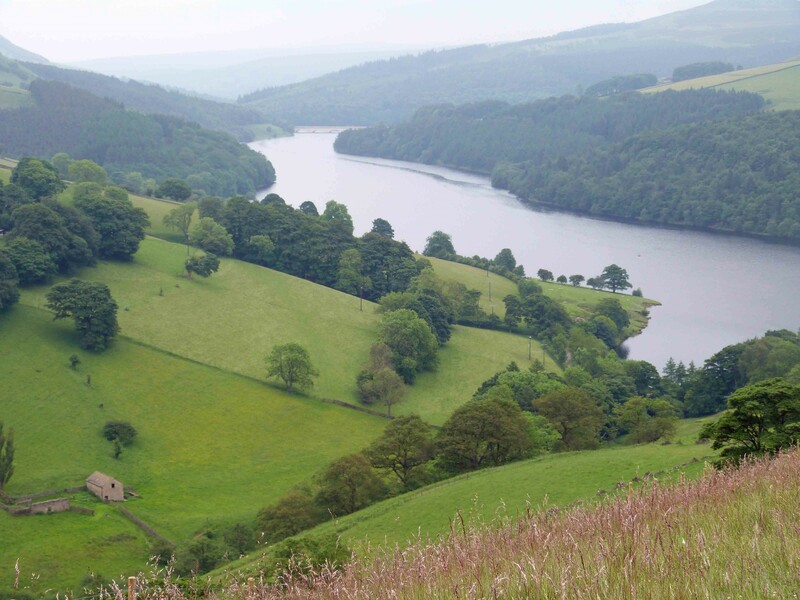 There are three dams in this area: Ladybower, Derwent and Howden. They provide an area of truly outstanding beauty and grandeur, no matter in which season you visit them. The waters of the dams are undisturbed save for flocks of geese and ducks and the occasional fishing boat and the only sounds are the cries of the grouse and the skylark’s song. Howden was built in 1901 and Derwent the following year. Ladybower was started in 1935 and finished in 1945. Inevitably there were outcries at the drowning of beautiful pastures and the villages of Ashopton and Derwent. Derwent Church had to undergo exhumation of its graves for re-burial. But today, the waters of the dams provide some of the most beautiful views in the Peak. When Howden and Derwent Dams were being built, the Derwent Water Board built a railway to carry the stone from Longshaw Quarry. Workers were housed in a temporary village of corrugated iron huts that became known as Tin Town. No trace of this now exists but in a very dry period, such as 1976 and 2004, the foundations of houses and field boundaries can still be seen. Ten of us (and 2 dogs) enjoyed a leisurely 5.6 mile walk from Chatsworth garden centre , towards Rowsley, and back. The weather was ideal as it was dry and a little cooler than the previous few days. By taking our time we were able to appreciate the beautiful countryside and enjoy the food we had brought with us. The next walk on Thursday 34 July will start at bakewell and follow the paths to Great Longstone. (We have done this bit before but at a different season). From Great Longstone we will come back to Bakewell on the Monsal trail. It is a 6.2 mile easy walk. Our walk in February was a relaxed walk round part of Swithland Wood and in to Bradgate Park visiting Old John and enjoying the views and the deer. In March we went back to Derbyshire for a pleasant gradual uphill towards Monsal Head and back by the River Wye where it was a bit muddy. We thought we had earned tea and cake in Ashford at the end of the walk. In April we went back to Leicestershire to the iron age fort of Burrough Hill. I don’t think many of us had been in that part of the county and I was surprised at the views on Burrough Hill. It was the kind of day when you walk in faith!. The day started with a downpour and our meeting place at Bramcote Hills car park was like a small stream. However, it was not only dry when we started the walk but stayed dry for the whole walk although we could see rain in the distance. Never trust a weather forecast! If anyone has any suggestions for walks (new ones or repeats) do let me know. You can contact me on 0115 917 5609 or at william.taylor64@gmail.com I put the details of each walk on our website as well as emailing members. On the next walk you will see lots of these (see picture) and lots of wild flowers in all their glory especially a section of cleared woodland. Pat & I walked the route this week and found it easy. Most of the uphill is in the first hour. Then there is a lovely walk through the woods marred only by its use as a popular mountain bike route so boots are advised..
We did the walk in under 3.5 hours including stops for coffee and lunch. I am sorry I cannot provide tables and chairs on this one! However there is a good tea room at Caudwells Mill on the way home or the Garden Centre but dogs are not allowed there. We will walk towards Haddon Hall turning towards Rowsley before we reach the Hall. From Rowsley we can either walk back through Beeley or follow the more direct route along the Derwent. Refreshments (and toilets) are available at the Garden Centre or at Caudwells Mill in Rowsley. However I intend to have a picnic stop as usual for lunch. One problem of giving out future dates is that other matters get in the way. I am sorry that I have to change the date of the next walk to Tuesday 22 April. The walk will be south of Melton Mowbray starting in the village of Somerby and visiting Burrough Hill (iron age) Fort and Burrough Hill. It is a 5 mile walk and there will be some hill climbing! Another reason bot to go on a Thursday is the permissive path through the woods below the fort is closed on Thursdays. Somerby is a small country village containing a parish church (All Saints), a primary school, a Doctor’s surgery,a pub, a small shop/post office, and a large Equestrian Centre. The population is close to 500.It is the largest village in the Parish of Somerby and is located in East Leicestershire close to the border with Rutland and comprises the villages of Burrough on the Hill,Leesthorpe, Pickwell and Somerby. Somerby parish church of All Saints. During WWII, the village was used as a base station and testing ground for the ill-fated assault on Arnhem, as depicted in the film A Bridge Too Far. Burrough On The Hill – Burrough on the Hill is a small village 5 miles (8 km) south of Melton Mowbray, Leicestershire, England.It has a population of between 150-200 and the parish church is St.Mary.Close by is the country park of Burrough Hill, an Iron Age hill fort. This is one of the highest points in Leicestershire at 690 feet (210 m) and provides excellent views towards Melton Mowbray. The village pub, Grant’s free house, has recently had a large refurbishment and extension, and offers several real ales, meals & outside decking. There used to be a train station shared with neighbouring village Twyford, and was named ‘John O Gaunt’ at the village in between the two. Trains used to go north to Melton Mowbray, and south to Leicester and Market Harborough. John O Gaunt station was next to an impressive 14 arch viaduct, but both were closed to train traffic in the 1960s. There is a currently a local bus service to Melton Mowbray and Oakham. Burrough Hill Fort – Burrough Hill Fort is by the small village of Burrough on the Hill in Leicestershire. The fort has not been dated with any certainty but archaeological evidence shows that the site was constructed about 200bc from pottery fragments. Later discovered remains include Romano – British pottery and Roman coins dating from the third and fourth centuries AD. It is possible the site was occupied for at least 600 years. This fort was certainly built for defence, it is hard to tell if the site was permanently occupied or just used in times of crisis. The ramparts, constructed of large stones, a foot or so across, bedded in layers of clay would have been topped by a timber palisade fence with strong gates to close off the entrance. Over time the encircling ditches have become partially filled and the ramparts reduced by erosion. This process was aided in the seventeenth and eighteenth centuries by the removal of stone for road making. The defences are still very impressive, a formidable barrier to potential attackers. In 1960, an excavation on the left hand side of the entrance revealed a cobbled road surface and the foundations of what was probably a guard house. One of the most interesting finds were the unused quernstones now on display at the Jewry Wall Museum in Leicester. These are used for grinding corn. Medieval ridge and furrow farming can clearly be seen all around the site. As early villages grew and forest cleared, the land was ploughed by oxen in strips which has left the pattern seen today. Soil was continually turned towards the centre of the strip, deepening furrows at the edges. By about 1350 the strip system was being replaced by hedged fields. In later years the fort was used for horse racing and other pursuits of the landed classes. It has a redundant Ordnance Survey trig point and a toposcope. Since the last newsletter we had a splendid walk in December with the Long Walks Group walking about 5 miles centred on Keyworth. This was followed by lunch at The Plough at Wysall which is a true pub with good hosts and good beer. Considering we were a party of 25 and there were already quite a lot of people there, it proved to be a good venue. Thanks to Anne & Mike Allery for organising it. January’s walk started at the Old Nottingham canal near Cossall and on this occasion I varied the walk to keep off the fields as much as possible since there was lying water everywhere. It was the sort of day when you look out of the window and think “That doesn’t look very nice”. The advantage of a group walk is that you do go out and have a good social time as well as some exercise! By the time you read this we will have been to Bradgate Park and Swithland Wood. The next two walk-dates are Wednesday 26 March and Thursday 24 April. I am moving the next walk to a week later: Thursday 30 January. I have had to do this to fit in a hospital visit. We will meet at Bramcote Hills car park to leave at 9.30. The walk is a 5 mile walk along fairly flat ground starting beside the old Nottingham canal, walking over fields from Awsworth to Cossall and back to the car. At the moment it is not too wet and muddy but it is winter and parts are a bit wet underfoot. To get to to the start take the Ilkeston Road A6007 to the Festival Inn junction (by the church), turn right and soon after take the Cossall road. Just after you pass Field House on the right there is a car park on the left. Ignore this one and use the next car park on the left which has an “oxbow” lay by and is adjacent to a footbridge over the canal (GR 484414) . It is not very big so I hope we can squeeze in to it. Unfortunately I have not seen any loos on this route. Please let me know if you will be coming. My contacts are still 0115 917 5609 or 07905125801 and of course email. We have enjoyed a dry summer and now we have reverted to sometimes wet, sometimes muddy, and sometimes really nice weather. All this has been taken with good humour by our members. 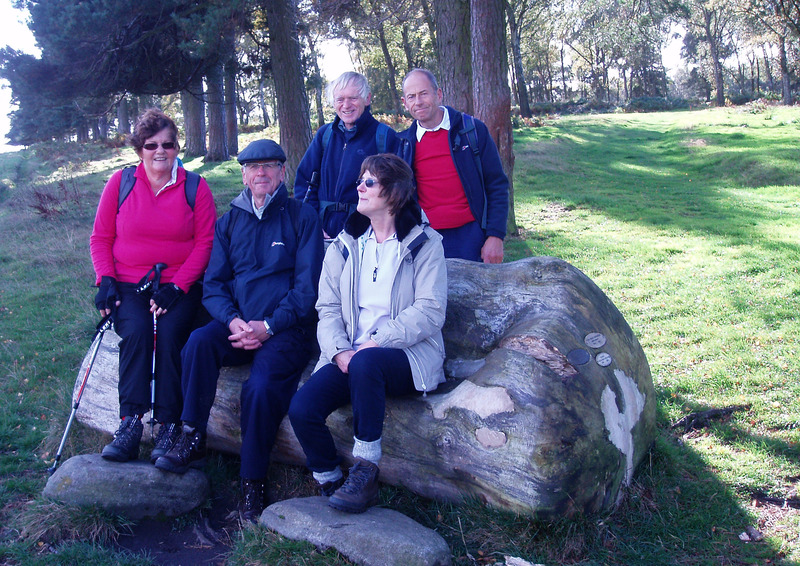 Ray & Sue led a very enjoyable walk in north Nottinghamshire in September. I was not so fortunate in October. Having done a recce walk on a brilliant Autumn day from Longshaw along Burbage edge and back by Higger Tor and Carl Wark, the day of the group walk was rather wet a lot of the time. However, the spirit of the ten of us who accomplished the walk was good. Greetings on a typically dull and wet November morning. I will send out a reminder nearer the time. Any queries please contcatme via email or 07905125801 or 01159175609. Eleven of us had a splendid walk last week on rolling Nottinghamshire countryside and in warm sunshine. Thanks to Sue & Ray who led this walk and at the lunch stop we were treated to a display of 4 buzzards circling and mewing overhead. Luckily Milo was too big for them! The next walk is to very different countryside. This walk takes us from the woodlands of the Longshaw Estate up to the gritstone edges, where climbers test their skills on some of the toughest climbs in the country. The views are spectacular, stretching from moorland in the north down into a valley of woodland and streams stretching up to the heights of Higgar Tor and Carl Wark. The latter’s name indicates its mysterious origins, ‘Carl’ being a synonym for the Old Man or the Devil. It is an Iron Age hill-fort consisting of a huge platform built of gritstone blocks up to 5ft across, with ramparts l0ft high and an elevation of l,250ft. Its original entrance lies at the SW corner, where you can see an information plaque and a stone trough. However, some archaeologists now tend towards the view that the massive fortifications still to be seen at the western entrance were probably constructed in the Romano-British period about 500AD. Once at the top of Higgar Tor, the views over to Mam Tor, Lose and Win Hill are wonderful and make the scramble among the rocks at the top of the tor, well-worthwhile. The distance is 5 miles and there is a height gain of 800 feet. There is some scrambling on the rocks although I believe there to be a way round. I will check on the recce. The start is the National Trust visitor centre grid ref SK 267807 where there is a cafe. National Trust members please bring your card for free parking. Otherwise there is a £4 charge. Due to the constant changing of the roads that are open in Chilwell we will continue to meet at Bramcote Hills car park to leave at 9.30. Currently we have 15 to 18 members on each walk. This represents up to 30 different members regularly participating in the walks. We have enjoyed walking in the Peak District near Winster and in Leicestershire in the National Forest and enjoying the good weather. It makes a change not to get muddy on a walk and the countryside is looking beautiful. We walk between 5 and 8 miles on a walk at not too fast a pace. We walk in the last week of the month on different days so that those with regular commitments do not always “miss out”. Our next walk in September will be north of Nottingham near White Post Farm on Thursday 26 September. Our starting time is 9.30am and whilst roads in Chilwell are blocked we are meeting at the car park in Bramcote Hills park. We will meet at Bramcote Hills park at 9.00 am on Thursday 22 August. The start is at Monyash at the parking area opposite the chapel OS 149666 or sat nav DE45 1JZ. If you come on the road from Bakewell turn right after the green with the Bull’s Head pub and tea rooms a;ongside. The parking area is on the left opposite the chapel. The walk is about 7.5 miles and goes along part of the Limestone Way before turning to Taddington where we can stop at the Queens Head, a walker friendly pub. From there we return to Monyash along paths and green lanes passing the top of Deep Dale. I will send out a reminder nearer the day asking for numbers etc. At last we are having better weather to enjoy our beautiful countryside but not before we had one last snowy walk. At the end of March we walked a circuit from Outwoods to Beacon Hill and home via Woodhouse Eaves. When I tried out the walk there was no snow which shows how the weather changes. The easy paths though Outwoods were icy but we had no mishaps. At the end of April the persistent cold winds had disappeared and we tackled 3 steep hills from Cromford. In my notes it was billed as a 5 mile walk but in practice it was 6.5 miles. However the views were superb and the weather conditions as good as it gets for walking. It is a bonus when we don’t come back muddy. The late spring produced a splendid display of wood anemones. Our walks are now enjoyed by between 15 to 20 people plus one or two dogs. New members are welcome; don’t hesitate to phone for a chat if you want to find out how the group “ticks”. Being a medium walking group I try to keep the pace comfortable. The next walks are planned for Wednesday 26 June, Tuesday 30 July, and Thursday 22 August. 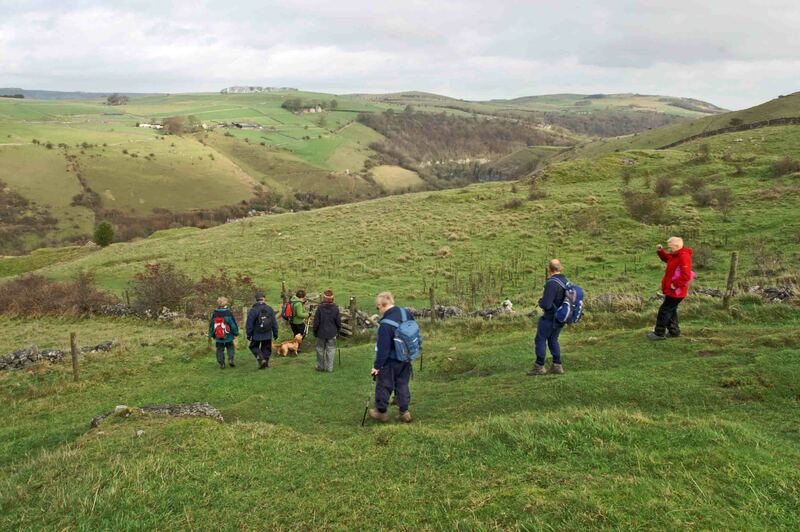 The August walk will be a joint one with the Long Walks group and will be centre on Taddington in Derbyshire. The next walk is on Thursday 30 May. 18 of you joined me & Milo last Tuesday on a strenuous 6.5 mile walk starting from Cromford. (my notes indicated a shorter walk and I apologise to those who found it a little too far). However most people said it was a good walk. The next walk will be Thursday 30 May and I have decided to repeat the 1st walk this group did. The regular walking group is not only larger now but the majority coming had not joined then. 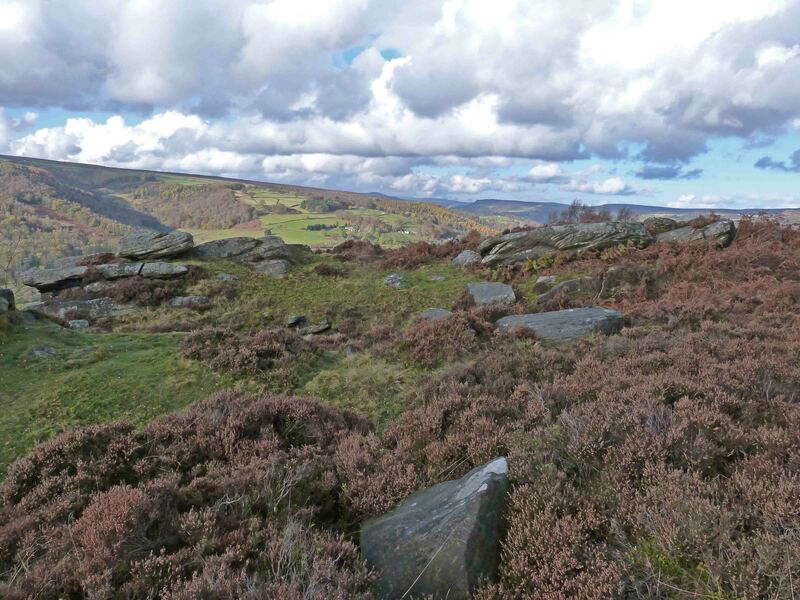 The walk starts at Beeley and walks around the Chatsworth estate over moorland and meadow. (Long walkers please note that the only common factor in the 2 walks is the stream running through Chatsworth Park). The walk is 6 miles long and is in the easy category. It’s been a case of dodging the weather in the last quarter. David Hurworth led a good walk round Hardwick Park in the autumn only to find the rain came halfway round. I then tried a walk in Darley Dale in October and had a miserable time ploughing through the mud so we went to Clumber Park instead and finally in November the sun shone on us for a splendid walk along White Edge, Froggat Edge and Curbar Edge. Although the sun was out getting up to Curbar Gap car park proved impossible by car as the road had iced up over night. Our half way stop included mulled wine and other drinks. We had a very enjoyable Christmas lunch with the Long Walkers and after what seemed to be a long gap Alan led a walk from Linby to Newstead Abbey and back where Milo could not resist chasing a peacock much to my embarrassment. It’s been good to welcome new members in the last quarter which has meant we have had about 18 people on the last two walks, Since I rotate the walks on different days those with other commitments can usually come along once or twice a quarter. Anyone wanting to join please contact me. The next walks are Thursday 21 March (a week early due to Easter), Tuesday 30 April and Wednesday 29 May. If you want to join my contact details are: Tel 0115 917 5609, mobile 07905125801, email william.taylor64@gmail.com . Twelve of us enjoyed some sunshine today, 27 February, walking along the old Nottingham canal and back along the Erewash canal. I am changing the date of the next walk to Wednesday 27 March due a clash of dates for me. We will walk from Outwoods about a mile south of Nanpanten in Leicestershire for a 6.3 mile walk including Beacon Hill. I will send full details nearer the time. Please let me know if you are coming so that we don’t start without you. Looking forward to seeing the group again. 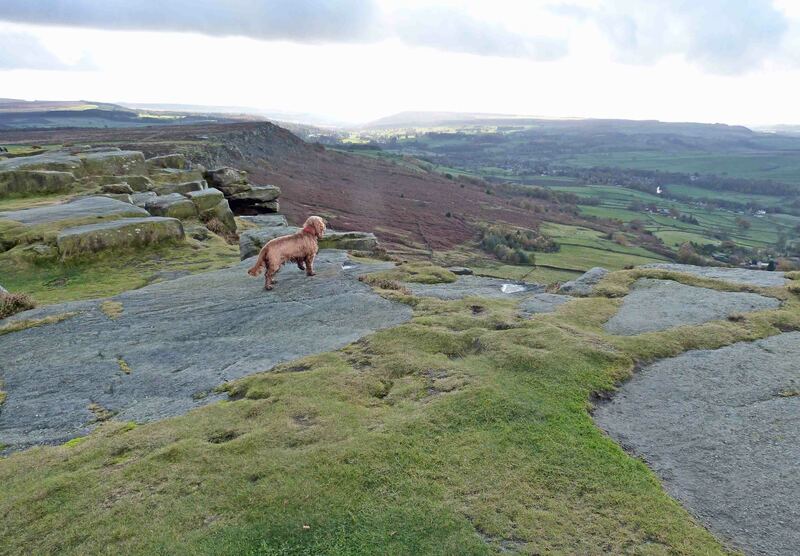 Yesterday 18 of us and 2 spaniels enjoyed the splendours of the Peak District on a “crisp” late autumn day. After the week’s earlier deluge it was good to be able to take advantage of the sunny day. In the shade it was below freezing so the road up to the car park was not possible when we arrived so there was a little extra walking. A friendly park ranger was all too happy to point out the herds of red deer on the moor below White Ridge. Half way round mulled wine was a favourite in the Grouse Inn. The next walk is Tuesday 11 December. Start and time will be advised later but the main objective is the lunch at the Stanhope Arms. It is too late to book a 3 course turkey meal but we can order other pub food on the day. I took some photos of the Peak District walk of which a couple are here. Circular walk of about 4.5 miles starting at Stanton by Dale village centre grid reference SK 465379; not too arduous apart from a reasonable number of conventional stiles. Christmas lunch will be at The Stanhope Arms in Stanton by Dale. They have agreed that we can leave cars in their car park. Please feel free to join us for the walk even if you do not wish to join us for the meal. The pub provides a wide variety of meals as can be seen on the 3 menus on their web site www.stanhope-arms.co.uk . As a brief guide, baguettes are £4 to £5, pub favourite meals £6, main course meals £8 to £12 and the Christmas Special three course meal £16. All, except the Christmas meal can be obtained on the day. Those that opt for the Christmas meal must choose before the 27th of November and pay a non-refundable deposit of £10. I shall need a few days leeway before the 27th November to get the booking and payment to the pub in time. Please let us know if you intend to join us for the walk, if you intend to join us for a meal and if you wish me to book you in for a Christmas Special meal (please send £10 deposit). In August we tried something different. With the Long Walks group we went to the Yorkshire Sculpture Park where we followed a 6 mile walk mainly outside the park and then the group looked at the sculptures in the park. The picture is Spiegelei. If you stand inside it you have a panoramic view. In September David Hurworth led a walk around Hardwick Hall park. It was a good walk but the rain caught us about half way round so lunch was postponed until we reached the cars. It was rather depressing to hear the Environment Agency warn that even normal rain this coming winter will cause flooding due to the saturated ground. I can vouch for this because I had to move the location of the October walk from Darley Dale to Clumber Park. The conditions on the hills around Darley Dale were atrocious. The picture shows the group in a novel gate in Clumber Park where we all went in one side, pushed the central barrier and popped out the other side. At least Clumber Park was drier. Hopefully we will have had a good walk at the end of November in the Peak District. Quite a few of you ask about Milo. Here he is more interested in my Cheese sandwich than his bonio. We have welcomed several new members in the last few weeks and I look forward to welcoming more in the future. My brief is to organise 5 to 8 mile walks. Most are 6 to 7 miles taken at a leisurely pace. Some are hilly and some are flatter e.g. Clumber Park where the height gain was 30 feet! Future walks will be: Tuesday 29 January, Wednesday 27 February, and Thursday 21 March. Please feel free to contact me on william.taylor64@gmail.com, text 07905125801 or house phone 01159175609. We have managed to avoid the worst of our “lovely” summer! The biggest problem is fitting in the recce walks as for these I am a bit of a fair weather walker. Just before the last newsletter came out we walked the south shore of Rutland Water on a day that promised all sorts of foul weather but we did not get wet. We even ate our lunch in a sunny spell. Even then Rutland Water was rather low. It’s now filled up! In June we went to a favourite location starting at Bakewell and visiting Great Longstone and Ashford in the Water. The hay meadows had a wonderful display of wild flowers. Finally in July we had a bit of a tough walk starting at Wirksworth passing the stone star circle and walking part of the High Peak trail and Cromford Moor. Little did we know it was going to be the hottest day of the year. I hope to continue this sort of variety in the coming months. I will have some walks at the short end (5 miles) interspersed with some longer ones. Newcomers are welcome. If you want to join my contact details are: Tel 0115 917 5609, mobile 0790 512 5801, and email william.taylor64@gmail.com. July 2012 Walk – We met at Bye Pass Road at 9.30 on Tuesday 24 July and drove to Wirksworth. If you approach by the B road the is a left turn just after the bridge over the A6 at Whatstandwell there may be parking on the road after the entrance to the Ecclesbourn railway but there is a car park sign pointing right as you approach the centre of Wirksworth. It is pay & display but there are good loos there. There is also a loo at Middleton Visitor Centre. We went astray at the end of the walk which meant extra road walking. As we had my daughter coming we did not have time to retrace our steps so I am hoping to go the right way on Tuesday. Please let me know if you are coming so we can wait if you are delayed. (Thanks to those who have already told me). Our walk on Wednesday 27 June. Starting in Bakewell it is a 6.5 mile easy walk via Great Longstone and Ashford in the Water hopefully not actually in the water by then. We will meet as usual in Bye pass road at 9.30. If you haven’t already told me you are coming, please let me know beforehand. This is so I know who to wait for at the Bye Pass Road meeting place and it helps me keeping a record of who is on the walk. Over the last 3 months we have had an amazing variety of weather from “normal” in the Manifold valley, to the hottest day in March near Cromford and also finding one of the steepest hills I have climbed for a long time (see photo), and finding a dry interval whilst we walked on Rutland Water’s south shore during the April monsoon. By far the most popular area is the Peaks but the other areas have been enjoyed not only by humans but also by 3 dogs – all well behaved. Our usual number of walkers is between 8 and 12 although 20+ members have walked with the group. For those new to the group or thinking of joining we walk during the last week of the month rotating Tuesday Wednesday and Thursday so that most people will find one or more days convenient. We always take a picnic as I cannot always promise a refreshment place although we do try to find one at the end. We meet at the Beeston end of By Pass Road in Chilwell where we can offer lifts and share cars to the beginning of the walk. By the time this newsletter is out we will have been on a walk near Belper. The next scheduled walks are Wednesday 27 June and Thursday 26 July. The walk in August will be a combined one with the Long Walks Group on Wednesday 22 August and will be centred on the Yorkshire Sculpture Park. I will lead an 8 mile walk and there will be an opportunity to look at the exhibits. There is a good cafe there as well. If you want to join my contact details are: Tel 0115 917 5609, mobile 0790 512 5801, and email william.taylor64@gmail.com. We have now settled on a monthly walk pattern (usually the last week of the month which does not clash with the Long Walks Group) and we are trying a rotating sequence of Tuesdays, Wednesdays and Thursdays starting with Tuesday 28 February. Since the last newsletter we have enjoyed walks in the Wye valley and Monsal Trail, Calke Abbey Park, and a route from Linby to Papplewick, and Newstead Abbey and back. All the walks are between 5 and 8 miles long. 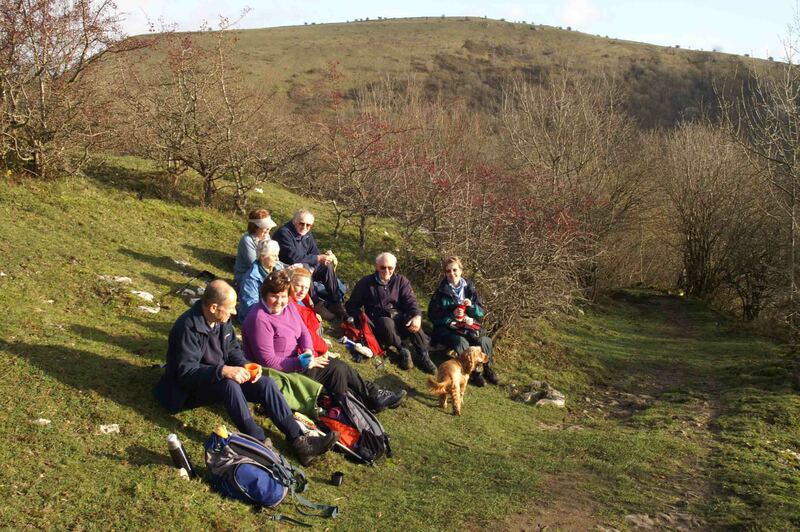 On all walks we meet up locally to car share, and bring a picnic lunch. If we are lucky we find a tea shop at the end! Somehow we have had good weather for each of these walks. We have a membership of about 20 active members. Because we are all involved in other activities an average of about 8 to 10 come on a walk. New members are always welcome. The dates of the next few walks are Wednesday 28 March, Thursday 26 April, Tuesday 22 May and Wednesday 27 June. The joys of winter walking. Rather than look out of the window, shiver and cuddle up on the sofa with a book or some electronic advice why not go for a good walk. Once warm you feel better and there is a lot of spectacular scenery near us. The bare trees look wonderful against the sky – there are many fine trees in the University Park, and we have a deer park at Wollaton. Further afield there is the Peak District and Rutland Water is good in winter with its birds spectacular. when you get home you will feel invigorated. The group’s next walk will be on Wednesday 4 January starting from Beeston at 9.30 and going to Ticknall for a 5 mile walk in and around Calke Park. The NT website says the coffee shop will be open. Other walks are planned for Thu 26 Jan; Tue 28 Feb; Wed 28 Mar; Thu 26 Apr; Tue 22 May; and Wed 27 Jun. We have had 3 walks since the group started in September. These have been around the Chatsworth estate, along the flatlands of Leicestershire in a very warm spell in September and either side of the Derwent in Derbyshire. The photo was taken near the village of Alderwasley where we came across this “comfortable” sofa made from wood. Not all our walks are so well catered for! We also found an excellent log beside a lake to sit on while we enjoyed our lunch. We are planning to walk at the end (or beginning) of each month to avoid clashing with the Long Walks Group who walk around the middle of the month. The aim is to have walks on different days of the week although that sometimes is easier said than done. If there are others in the group who would like to lead I would be pleased to hear from you. I will still do the organising if you wish. We had a splendid walk on 30 November 2011 starting off in sunshine and no rain (I cannot promise this every time!) and lovely scenery and of course the company was good. Here are two photos taken during the walk on 30 November (If you click on them you may see them larger). – Bill, December 2011.